I am so excited to be able to offer this pair of basket workshops with JoAnn Kelly Catsos of Ashley Falls, MA. JoAnn has won numerous awards for her beautiful black ash baskets and in 1999 she was asked to weave an ornament for the White House Christmas Tree. She also was one of the first to receive the Certificate of Excellence Level I Basketmaking from the Handweavers Guild of America. JoAnn and her husband Steve produce all the weaving materials, hardwood rims and handles, and molds themselves. I hope you can join JoAnn and me for this exciting and fun class. This is the first basket I made with JoAnn and is actually four baskets in one. It features a cathead base with a beautiful quadrafoil lid, along with two small cheese boats (one round and one oval) to hold your sewing notions. 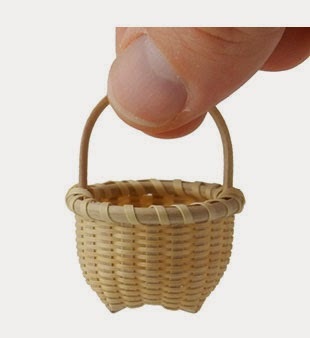 The baskets are woven of finely prepared black ash and finished with hardwood rims. Twill experience is required for this class and due to the small size of the cheese baskets, patience and attention to detail is helpful. Materials will be mailed to participants so that the splint and rims can be sanded before the workshop. Class fee includes all materials, handouts and use of mold, weaving stand and tools. Add two more cheese boats to your lidded sewing basket. Using a hexagonal pattern, weave a 1" round and a 1" x 3" oval out of finely prepared black ash splint. Complete your baskets with double lashed hardwood rims. 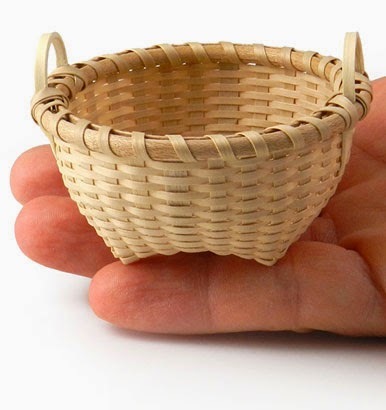 This 2.5" diameter basket’s design is simple, yet classic. Like its 4 inch brother, it is chase-woven on a cathead mold and completed with two tiny black ash side-handles and hardwood rims. 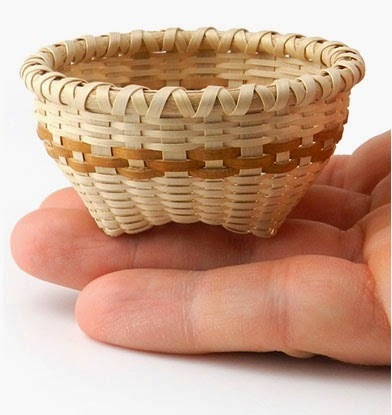 This eye catching 2.5" diameter basket features stakes that are two different widths and is woven of black ash with three accent bands of elm bark. The tiny hardwood rims are double lashed. This kittenhead basket is the 1" version of JoAnn’s 6" diameter Classic Cat. 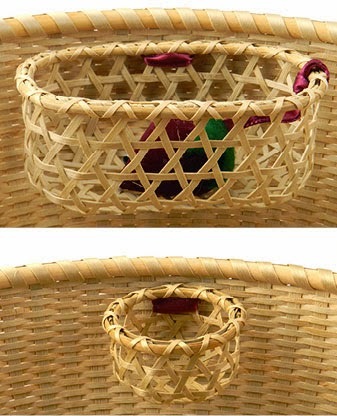 Basic black ash splint basketry techniques, such as forming the “cat ears,” chase weaving, notching a handle, and lashing hardwood rims, are used.